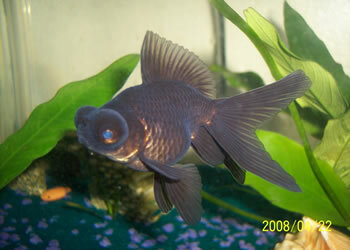 As the name suggest, the Moor Goldfish only comes in one colour – black. It has a beautiful velvety look and telescope eyes. It is a very popular goldfish variant and kept by millions of aquarists. 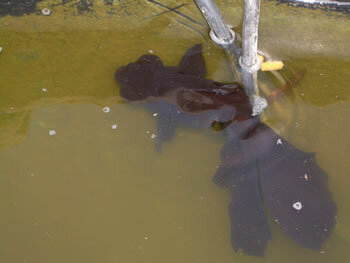 You can find the Black Moor Goldfish in most aquarium shops and it is not a very tricky goldfish type to keep. Some Black Moor Goldfishes can change colour when they become elderly, but they are a minority. The caudal fin can of a Black Moor Goldfish can be broad, ribbon or butterfly. During the 1930’s, Black Moor Goldfish with intriguing veiltails could be obtained in England, but this type of Black Moor Goldfish is unfortunately no longer available. An ideal Black Moor Goldfishes have a double caudal fin and the lobes should be forked and rounded. The body depth of a Black Moor Goldfish should preferably be more than 2/3 of the body length, and the dorsal fin should be from 1/3 to 5/8 of the body depth. The pectoral and pelvic fins are paired on all Black Moor Goldfishes and should always be equally long. The telescope eyes found on the Black Moor Goldfish are going sideway, which distinguish this fish from the Celestial Goldfish which telescope eyes are going upward. leafs can hurt your Black Moor Goldfish. There are reported cases where the eyes have actually fallen of the Black Moor Goldfish due to unsuitable aquarium decorations. Choose soft and silky plants without any sharp points. Many aquarium decorations and ornaments are highly unsuitable in a Black Moor Goldfish aquarium. The Black Moor Goldfish resembles the other goldfish variants when it comes to food; it is a very happy eater and it is definitely not hard to get your Black Moor Goldfish into accepting all kinds of food. Sinking pellets is a better choice than floating ones, since food that floats around the aquarium will be harder to “hunt down” for the Black Moor Goldfish. Frozen food such as shrimp, bloodworms, daphnia and cooked cocktail shrimp are all suitable types of food and you should also include vegetable matter like lettuce, peas and zucchini the diet. Didn't find the info you were looking for? Register for free and ask your question in our Aquarium forum or our goldfish forum! Breeding Koi< - A guide to breeding Koi carps.